Boy, I’m glad I knew nothing about this film going into it, because after a first act of very clever teasing I was absolutely floored by the dramatic midpoint reveal. As the buzz on this film heats up, mostly likely this dramatic moment will become known to audiences and thus diminish the experience of the film. If you can hold out reading these advanced reviews and blindly let Mark Romanek guide you through his haunting existential humanist journey it will be a joyous reward. I’ll be as brief with the plot as possible, Karen, played by Carey Mulligan is a caregiver in present day watching an operation of one of her patients. Her narration recalls the story of her and her friends in a quaint English countryside boarding school, a particularly snobby school with strict teachers and such. Nothing we haven't seen before. 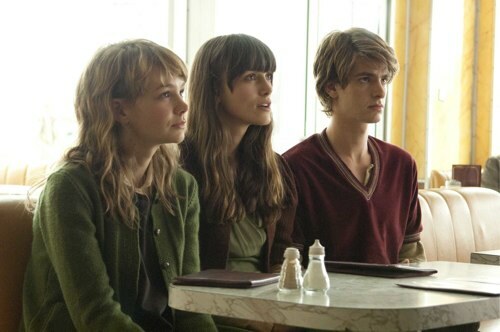 Within the class are three sympathetic characters, Kathy as an intelligent and introspective younger girl, Ruth, the A-type popular gal and Tommy, an awkward wallflower prone to outbursts of rage. There's something wrong afoot, but we can't put out fingers on it. It seems to be a storybook idyllic place with a few inconsistent additions - an electronic monitor device worn by each child, there's no parental figures, and almost no contact with the outside world. What gives? Romanek and writer Alex Garland, who adapted the novel of the same name, make a concerted effort to keep the audience in the contained point of view of the three kids. It’s part of the clever deception going on, an intimate three-way love triangle over top of a high concept scenario, which we’re kept in the dark from for most of the movie. The core emotions are the same though, and enhanced by the limitations forced upon the characters by the science-fictiony concept. Tonally it’s the kind of movie M. Night Shyamalan used to make. The pacing is deliberate, dialogue quiet and subtle, small scale character-based intimacy against a larger backdrop of big ideas and big threats. Like Children of Men, we are asked to accept the alternate future society as is, without the usual backstory explanations. And Romanek never diverts from this point of view. Naturally I wanted to know more of outside world, and admittedly there was much room for more salacious plotting. The film could have easily turned into a thriller like Children of Men, but admirably Romanek remains true to his tone and character-based emotions. Andrew Garfield is compelling as the man in between Carey Mulligan and Keira Knightley's affections. He has a unique physicality, an immensely interesting face and a lanky gate, which adds more depth to his character than his dialogue. Carey Mulligan, like her performance in An Education, can also say as much with a glance of her expressive eyes than her words. Like great science fiction, the speculative concepts allow us to examine our own place in the world. Never Me Let Go is almost as good as any of the great humanist sci-fi films such as THX 1138, Gattaca, The Truman Show, Moon. It’s a sombre haunting and memorable film which penetrates deep in one’s mind, body and soul.